Our last AGM was on 17th October 2018, when we elected the current Round Hill Society committee. The Minutes of this meeting, held at Pavilions, Richmond House, are posted here. Contact details of committee members appear on the back page of The Round Hill Society's printed magazine, which comes through your letterbox every three months. * Environmental Issues cover things like gardens, wildlife, open gardens events, & campaigns such as The Royal Horticultural Society's "It's your neighbourhood" and "Britain in Bloom". This is Jan Curry's area of expertise. Problems of noise / odour / fugitive particles (e.g. from Hollingdean Depot) are dealt with under PLANNING. When prompted by planning applications which raise concerns about parts of our conservation area, residents often contact The Round Hill Society, which can let other residents know. Our printed newspaper Round Hill Reporter is delivered to Round Hill residents free of charge every three months. Its aim is to keep residents in the area in touch with local news, events and each other. 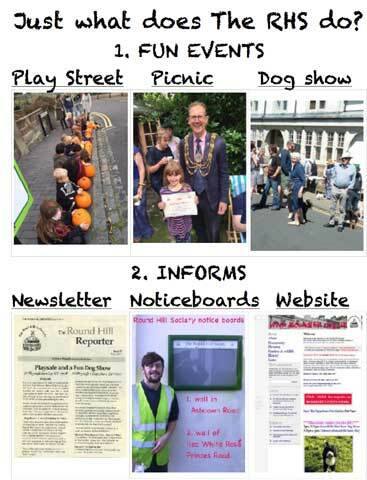 Every effort is made on this site and in the regular newsletter, to present a fair and balanced view while aiming to accept any material from Round Hill residents. The society was formed in 1999 and holds an annual get-together open to all Round Hill residents as well as organising local events such as street parties, open gardens and carol singing. Read the Round Hill Conservation Area Character Statement - and see how the Council responded to feedback from RHS and individual residents (MS Word Doc: pages 13-18) in updating it. 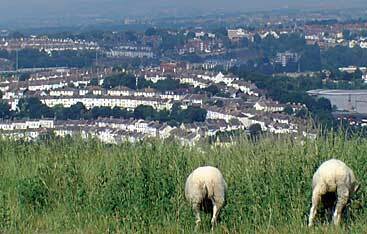 Conservation Officer in Brighton and Hove City Council's Development Control Department clears up confusion on The Round Hill Conservation Area's Article 4 Direction. ! Brighton and Hove City Council's Conservation Advisory Group - details of the local representatives on this Group and links to the web sites of the other Conservation Areas in our city. Urban Characterisation Study - review and comment on the Council's 4-page PDF draft on the habits of Round Hill residents and the character of our neighbourhood. The Round Hill Society's previous AGMs. We currently have 10 committee members. 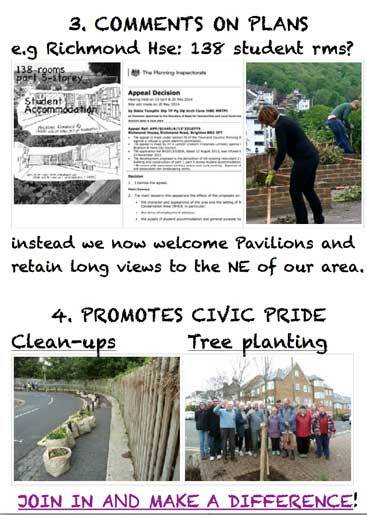 We do hope that new residents will come forward to raise our membership before or at Our Annual Get-together. which is OPEN TO ALL ROUND HILL RESIDENTS. Looking through past copies of the Minutes (below) will give you an idea on how committee members plan. However, you don't have to be on the committee to organise events compatible with what we are trying to achieve. You can join use or work with us and we also appreciate that many people work independently to improve the neighbourhood on an ad-hoc basis. Note that we are now describing these meetings as Annual Get-togethers since we aim to make them more informal.